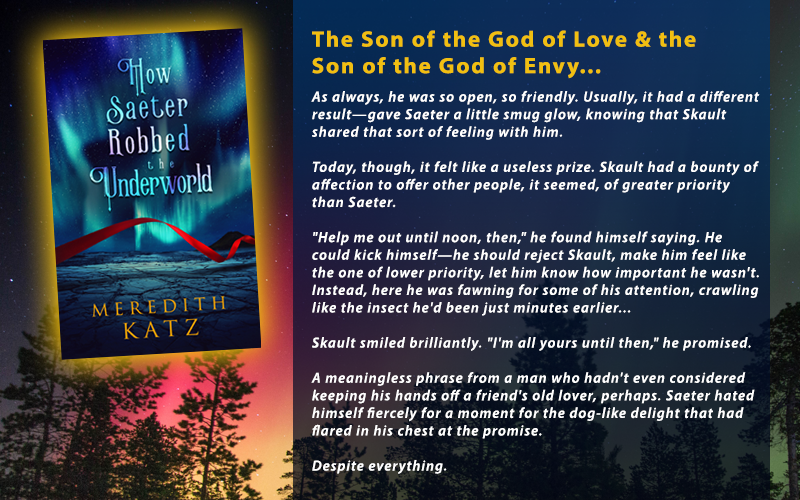 I’m super excited to announce that my latest novella, How Saeter Robbed the Underworld, is now available for pre-order with Less Than Three Press! A mythological romance between a trickster demi-god and the son of the God of Love—what complications could there possibly be? ♥ Get a 15% 40% discount when you pre-order! The day before his coming-of-age ceremony, Eirik has a fight with his best friend—who had pointed out that, adopted by a pair of traveling warriors as Eirik was, how can he know who his ancestors are to celebrate them? Embarrassed and angry, he’s not in the mood for the story his fathers insist on telling him. Despite himself, however, Eirik becomes engrossed in the tale of the son of the god of Love who has never felt pain, and the son of the god of Envy who always does, how they struggle with each other and their community, and how, ultimately, they trick the underworld out of a very special prize.